Interested in an ultra-wide monitor? Here, you’ll find everything you need to know about ultrawide displays as well as the best deals currently available. The ultrawide format provides you with more horizontal screen space which makes gaming and movies more immersive, work more productive, and your monitor simply looks cooler. In the list below, you’ll find the best ultrawide monitors for gaming, work, and any other purpose. As you can see, there are quite a few LG ultrawide displays in our list. That’s because LG is the main ultrawide IPS panel manufacturer; in fact, all the IPS monitors in this list feature LG’s panels while the VA panels are either made by Samsung or AU Optronics. So, you’re getting a first-class display with any ultrawide monitor listed here, just make sure you pick the right combination of specifications for your needs and preferences. Ultrawide monitors are available in different screen sizes, resolutions, and refresh rates in addition to differentiating by panel type and certain features; so, take note of our tips in the following reviews below to ensure you’re getting the best ultrawide monitor for you! If you’ve got a limited budget, do not despair – you can still get an excellent ultrawide monitor! In this category, you’ll find the best ultrawide monitors ranging from under $200 up to ~$350. Want a cheap ultrawide monitor that’s reliable and worth the money? Check out the LG 25UM58-P. This 25″ 21:9 monitor features an IPS panel with vibrant and precise colors covering 99% of the sRGB color space with true 8-bit depth. It also boasts the 178-degree wide viewing angles and a quick 5ms response time speed which means that the picture won’t shift in tone when looked at skewed angles and that there’ll be no trailing of fast-moving objects. The 2560×1080 ultrawide resolution on a 25″ screen results in an incredibly rich pixel density of 111 PPI (pixels per inch) which provides maximum details and plenty of screen space. Moving on, the LG 25UM58 offers plenty of useful features including On-Screen Control that allows you to adjust certain OSD (On-Screen Display) settings in a desktop application and Screen Split with numerous different layouts for multi-tasking. Gaming features include pre-calibrated picture presets including two FPS modes and one RTS mode, Dynamic Action Sync which makes the monitor bypass certain image post-processing for minimal input lag, and Black Stabilizer for better visibility of objects in dark areas in video games. You can also overclock the monitor up to 75Hz for a slight boost in motion clarity. The design of this LG ultrawide monitor includes very thin bezels at the top and sides, though the tilt-only stand is not as pretty. Luckily, it’s detachable and the monitor has 75 x 75mm holes for VESA mount. Connectivity options include two HDMI 2.0 ports and a headphones jack. Because the monitor is fairly short, you may consider buying a third-party monitor riser or stand. The LG 25UM58 is an exceptional monitor for the money. However, note that this 25″ ultrawide monitor is as tall as a regular 20″ 16:9 widescreen monitor. So, despite its vibrant colors and high pixel density, many users will find it to be simply too small. We suggest investing a bit extra for the following monitor. The LG 29WK600 29″ monitor is as tall as a regular 23″ screen which makes it a lot more appealing than the previous display. Moreover, it supports AMD FreeSync and HDR (High Dynamic Range). Just like the LG 25UM58, the 29WK600 model uses an IPS panel with 99% sRGB color gamut, wide viewing angles, and quick response time. However, since it also has the 2560×1080 resolution yet a bigger screen, it has a slightly lower pixel density – though at 96 pixels per inch, you still get a crisp and sharp image quality. The LG 29WK600 supports HDR for compatible content and has a slightly brighter panel with a 300-nit peak luminance as opposed to 250-nits of the previously mentioned 25″ model. While the monitor can accept the HDR10 signal, its brightness, contrast, and color gamut are really low for a noteworthy HDR viewing experience. But since this entry-level HDR doesn’t add to the monitor’s price, it’s tolerable. Besides, some HDR content will even look slightly better. In addition to LG’s features such as Black Stabilizer, D.A.S, picture presets, On-Screen Control, and Screen Split, the LG 29WK600 also offers customizable crosshair overlays. Moreover, it supports AMD FreeSync with a 40-75Hz dynamic refresh rate range over both HDMI and DP. So, if you have an AMD FreeSync-compatible card, you get a variable refresh rate which eliminates all screen tearing and stuttering within 40-75FPS range. You can use FreeSync with compatible (GTX 10-series, RTX 20-series, or newer) NVIDIA cards as well, though only over DisplayPort. 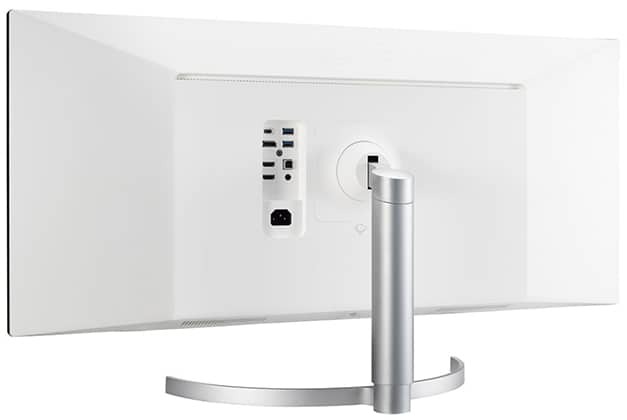 The LG 29WK600 design is tilt-only but it’s VESA mount compatible (100 x 100mm). Connectivity options include two HDMI 2.0 ports, a DisplayPort 1.2, a headphones jack, and two 5W MaxxAudio built-in speakers. All in all, the LG 29WK600 is the best ultrawide monitor for productivity, gaming, and everyday use for the money. 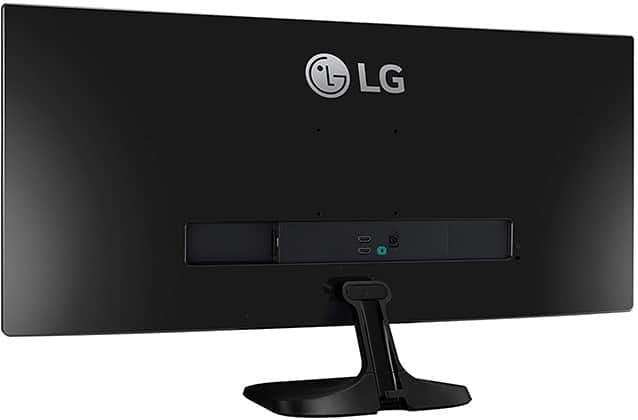 The next monitor is the 34″ version of the LG 29WK600 which is larger but has a lower pixel density. Continue reading to find out how that affects your viewing experience. The LG 34WK650 is the 34″ model of the LG 29WK600 and it features all the same specs and features. Due to its larger screen size, it has a lower pixel density of 81 PPI which is equivalent to 1920×1080 on a 27″ screen. So, you get notably less screen space and detail clarity. If you plan on doing a lot of work that includes reading and typing, note that the text on this screen is not as clear as on the 29″ model but somewhat smudgy and blurry. In video games and movies, this is not as noticeable allowing you to take advantage of the big screen for a more immersive viewing experience. Overall, the LG 34WK650 is perfect for watching movies and playing video games, and tolerable for web-surfing and even occasional editing or office-related tasks. But if you intend on using the monitor for work as well, go with the 29″ model or invest in a 3440×1440 34″ ultrawide monitor. 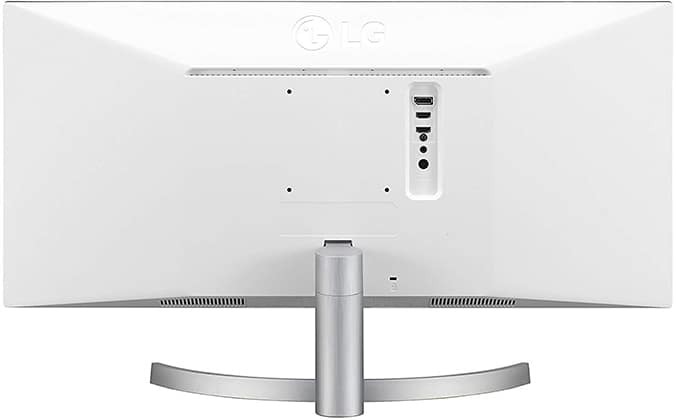 Unlike the LG 29WK600, the LG 34WK650 21:9 monitor has a height-adjustable stand (up to 110mm). Unlike FreeSync monitors which are based on VESA’s Adaptive-Sync open (and free) standard, G-SYNC displays feature an extra piece of hardware (a module) that’s installed by NVIDIA. This module ensures a wide variable refresh rate range, lower input lag, and variable overdrive for less ghosting at higher frame rates, but it also increases the monitor’s price. Since the G-SYNC module doesn’t work with AMD cards, you should obviously buy a FreeSync monitor if you have an AMD Radeon GPU. However, if you have an NVIDIA GTX 10-series, RTX 20-series, or newer GPU, you can also get a FreeSync monitor as you will get a variable refresh rate. This way, you can save some money on the monitor, but you won’t get the advantages of the G-SYNC module. If you want both: a large 34″ screen and a high pixel density for a crisp picture quality, the LG 34UC80 is the most affordable option and yet it offers some premium features. 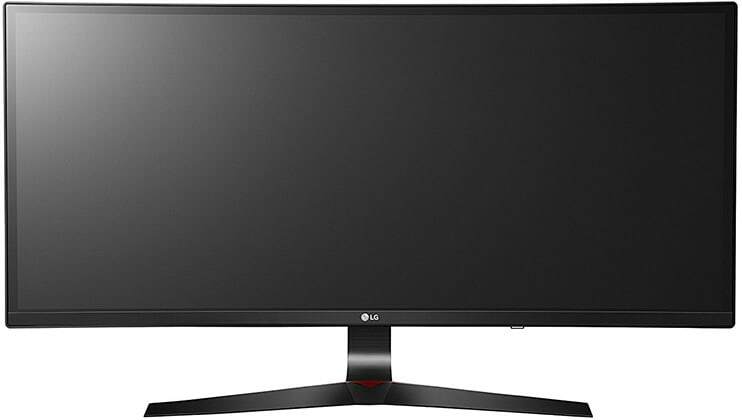 The LG 34UC80 is based on an IPS panel with 10-bit color depth (8-bit + FRC), 99% sRGB color gamut, and 3440×1440 UWQHD screen resolution. With a pixel density of 110 PPI, you get the perfect ratio of pixels per inch allowing you to enjoy plenty of screen space as well as maximum details with no scaling needed. Whether you need a lot of screen real estate for work or want vivid details in video games, the LG 34UC80 delivers! The LG 34UC80 supports AMD FreeSync with stable G-SYNC performance over the DisplayPort, but with a rather narrow dynamic range of 55-75Hz. It’s possible to extend its dynamic range using CRU to around 48-75Hz though your mileage may vary depending on the model as not each panel is entirely identical. Despite its narrow dynamic range out of the box, the LG 34UC80 is still the best 3440×1440 IPS FreeSync monitor for the money. Note that there are no 3440×1440 60Hz/75Hz G-SYNC models available at all. Other features include Screen Split, On-Screen Control, Picture in Picture and Picture by Picture modes, Black Stabilizer, and pre-optimized picture presets. The LG 34UC80 3440×1440 monitor has a 1900R screen curvature which further increases the immersion. If you’d rather have a similar but flat screen model, check out the LG 34UM88C though it’s more expensive. Turning to the connectivity, there are two HDMI 2.0 ports, a DisplayPort 1.2, a headphones jack, and a dual USB 3.0 hub (one upstream, two downstream ports – one with fast-charging). You can elevate the screen up to 120mm, tilt it by -5°/20°, and VESA mount it via the 100 x 100mm pattern. 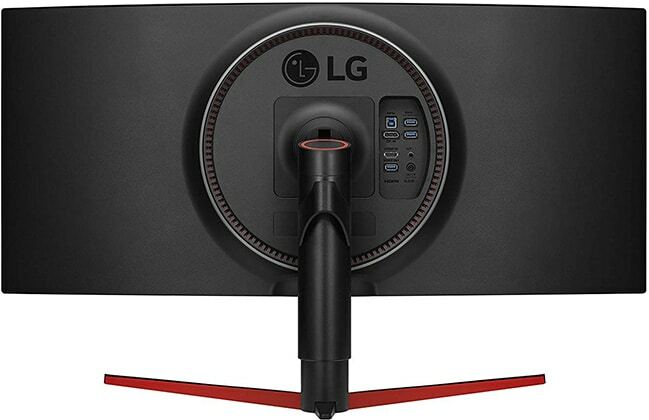 On Amazon, there’s also a model of this monitor with integrated speakers, the LG 34UC88. 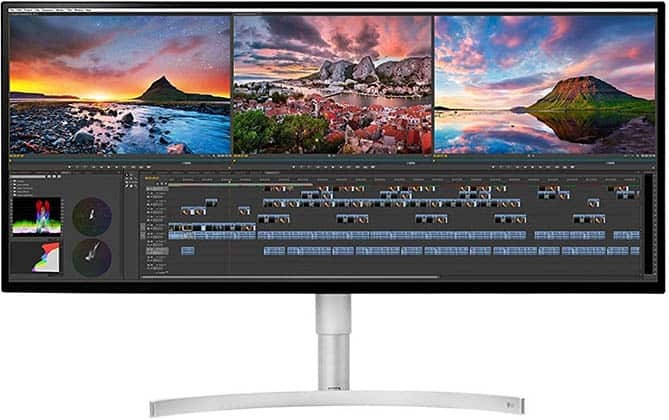 In short, the LG 34UC80 is the best 34″ 1440p ultrawide monitor for office-related work and audio/video editing due to its spacious and vibrant picture quality. It’s also great for gaming if you prefer better visuals and immersion over high refresh rates. As a cheaper alternative, you may want to consider the Samsung S34J55W. It’s also a 34″ 3440×1440 ultrawide monitor but with a VA panel. So, you get a higher contrast ratio but more ghosting in fast-paced video games. Want a big 34-inch curved monitor with a 144Hz refresh rate that’s affordable? The LG 34UC79G-B is the best 144Hz 1080p ultrawide gaming monitor for the money. Just like with the LG 34WK650, you get a pixel density of 81 pixels per inch which is fine for gaming but not practical for work. However, there are a few more reasons why such a low resolution might even be a good thing. First of all, if the LG 34UC79G had a higher resolution and kept the 144Hz refresh rate, it would be significantly more expensive. Secondly, 1080p ultrawide is a lot less demanding on your CPU/GPU than 1440p ultrawide, in turn, allowing you to actually reach higher frame rates in newer games to really take advantage of high refresh rates. Lastly, at this price range, you cannot beat the gameplay immersion the LG 34UC79G provides. You get a high refresh rate and a quick response time as well as a large curved monitor with vibrant colors. A 144Hz refresh rate makes the display refresh the image more than twice as fast than a regular 60Hz monitor which effectively reduces input lag and increases gameplay responsiveness. The LG 34UC79G supports AMD FreeSync (no issues with G-SYNC cards) over DisplayPort with a 50-144Hz dynamic refresh rate range thus supporting LFC (Low Framerate Compensation). The LFC technology is automatically supported on all FreeSync displays with the maximum variable refresh rate range that’s at least two times the minimum (for instance, at least 37-75Hz, 72-144Hz, etc or wider than that). In short, LFC kicks in when your FPS rate drops below the lower end of the dynamic range and makes the display’s refresh rate double or triple the frame rate in order to maintain smooth performance until your FPS rate is back within the dynamic range. Moving on, the LG 34UC79G ultrawide curved monitor also offers the 1ms Motion Blur Reduction (MBR) technology. This technology only works at fixed refresh rates so it cannot be used at the same time as FreeSync. Note that you can use MBR with NVIDIA cards as well. Once enabled, the 1ms MBR technology causes backlight strobing which simulates CRT-like motion clarity with minimal ghosting and motion blur. However, it also causes the screen to be dimmer, so it should be used only when playing fast-paced games. Other gaming features include Black Stabilizer, D.A.S, customizable crosshairs, and FPS/RTS presets. The LG 34UC79G is VESA mount compatible and you can also elevate its screen up to 110mm and tilt it by -5°/20°. Connectivity options include a DisplayPort, two HDMI 2.0, a headphones jack, and a dual-USB 3.0 hub. The screen curvature of 3800R is subtle but definitely noticeable. On balance, the LG 34UC79G is the best gaming monitor for $500 if you want an ultrawide curved gaming monitor with a buttery smooth performance. 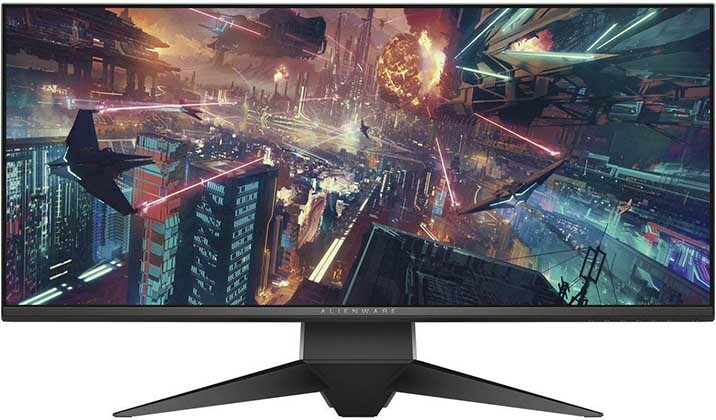 The monitor is also available with G-SYNC instead of FreeSync, the LG 34UC89G, which will cost you an extra $100-$400; we’ll get into this particular model later on. 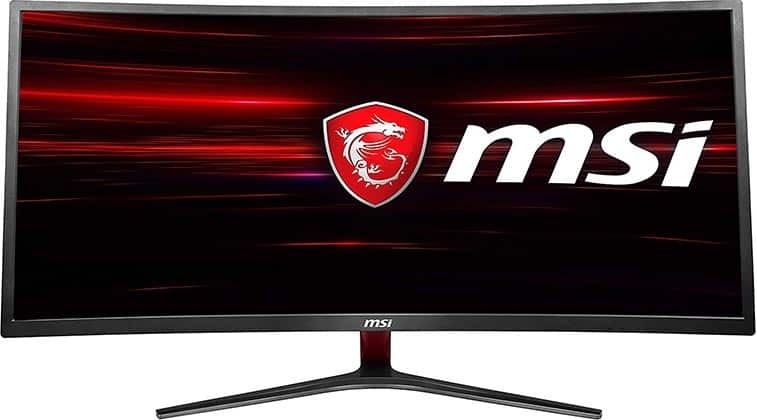 The MSI Optix MAG341CQ is the only ultrawide gaming monitor under $500 that offers both 3440×1440 and 100Hz. Based on a VA panel with a 3,000:1 static contrast ratio, 3440×1440 resolution, and 110% sRGB color gamut, the MSI MAG341CQ offers an exceptional picture quality with vivid black shades and vibrant colors. Further, thanks to its 100Hz refresh rate, fast-paced motion in video games is a lot clearer making for an immersive gaming experience. The jump from 75Hz to 100Hz is particularly noticeable! Alas, VA panels don’t handle ghosting as good as the IPS ultrawide models which results in prominent smearing and ghosting of fast-moving objects in video games. For casual gaming, it’s tolerable considering the specs you get for the price – but if you intend on playing any games competitively, the ghosting can be bothersome. AMD FreeSync is supported with a 48-100Hz variable refresh rate range and there are no issues when using it with NVIDIA cards. Other features include pre-calibrated picture presets (FPS, RTS, Movie, Eye Saver, and User), custom crosshairs, overdrive (on/off), and PiP/PbP modes. Unfortunately, the monitor has a tilt-only stand and no VESA mount compatibility while connectivity options consist of a DVI, an HDMI, and a DispalyPort. The screen has an aggressive curvature of 1800R for extra immersion. 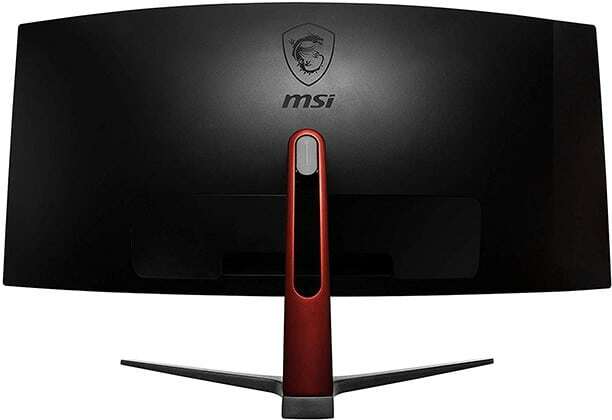 The MSI MAG341CQ is an exceptional monitor for the price. If you prefer more graphically-oriented games to competitive online games, it’s definitely the right gaming monitor for you. The LG 34GK950F is the first ultrawide gaming monitor to feature both 3440×1440 and 144Hz allowing it to deliver uncompromised image quality and performance. Based on LG’s latest Nano-IPS panel, the 34GK950F offers a wide color gamut with 98% DCI-P3 coverage, 10-bit color depth (8-bit + 2-bit FRC), and a 400-nit peak brightness. Moreover, the monitor supports HDR with VESA’s DisplayHDR-400 certification which we still find too weak for a notable HDR viewing experience. Note that in order to get 3440×1440 at 144Hz, you will need a graphics card with a DisplayPort 1.4, otherwise, you’ll be limited to 120Hz at 3440×1440. Besides the common features such as Black Stabilizer, Crosshair, D.A.S, and FPS/RTS presets, the LG 34GK950F also offers 1ms Motion Blur Reduction. It supports AMD FreeSync 2 (48-144Hz range) which in addition to providing a variable refresh rate for AMD cards, ensures minimal input lag when gaming with HDR enabled. G-SYNC works without issues as well for compatible cards and you can simultaneously use it with HDR. All in all, the monitor has a stunning image quality and smooth performance without any prominent ghosting or visual artifacts. 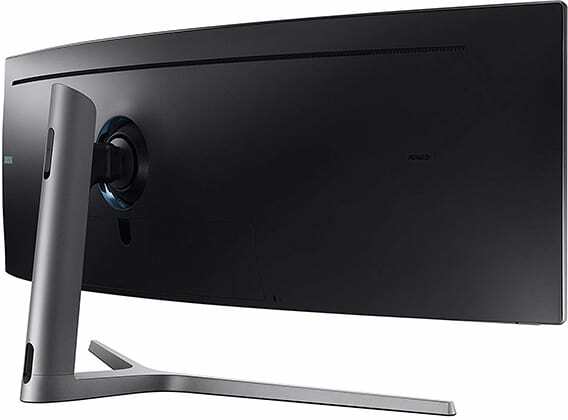 The LG 34GK950F has a curvature of 1900R, it can be tilted by -5°/15°, height adjusted up to 110mm, swiveled to the left or right by +/- 20°, and it’s VESA mount compatible. Connectivity options include a DisplayPort 1.4, two HDMI 2.0, a dual-USB 3.0 hub, and a headphones jack. On the whole, the LG 34GK950F is the best ultrawide gaming monitor currently available. 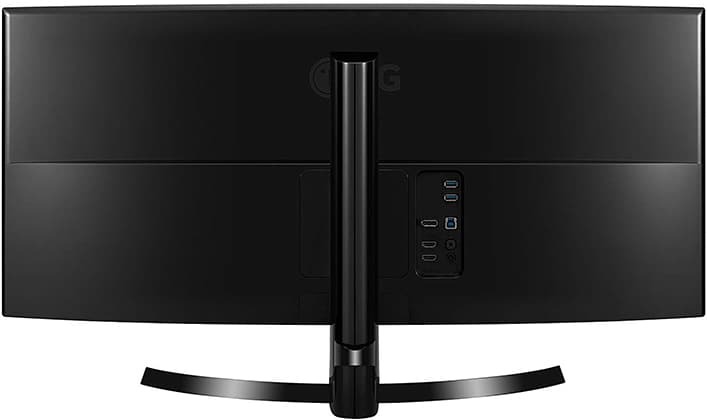 The G-SYNC version of this monitor, the LG 34GK950G is available for ~$400 extra yet it has no HDR support and it has a native refresh rate of 100Hz (120Hz overclocked). If you’re interested in a 3440×1440 120Hz G-SYNC model, we’ve picked a better alternative for the money. 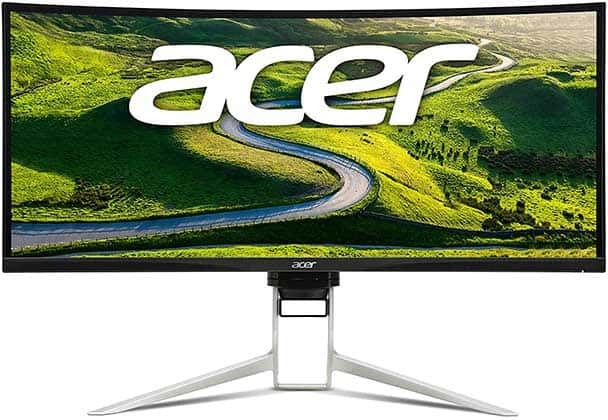 In case you want an even bigger ultrawide monitor, the Acer XR382CQK is the best 38″ model for gaming. 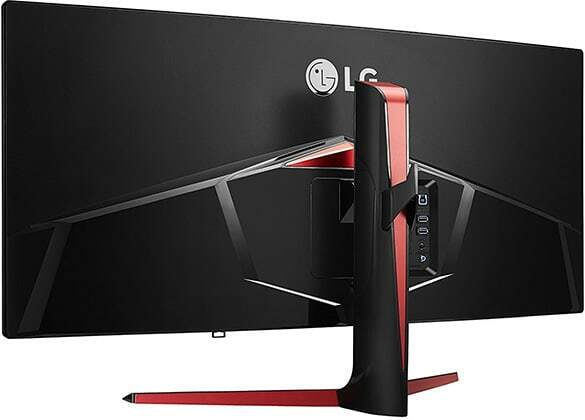 This gigantic LG ultrawide curved monitor isn’t only bigger than its 34″-35″ counterparts, it also has a higher screen resolution of 3840×1600 pixels; so, you still get the ideal pixel density of 110 PPI as well as a larger screen. The IPS panel of the Acer XR382CQK supports 10-bit color via dithering and covers 100% of the sRGB color gamut. It also supports HDR but has a peak luminance of only 300-nits and a contrast of 1,000:1. It’s possible to overclock the monitor up to ~100Hz though your mileage may vary as each unit is slightly different. 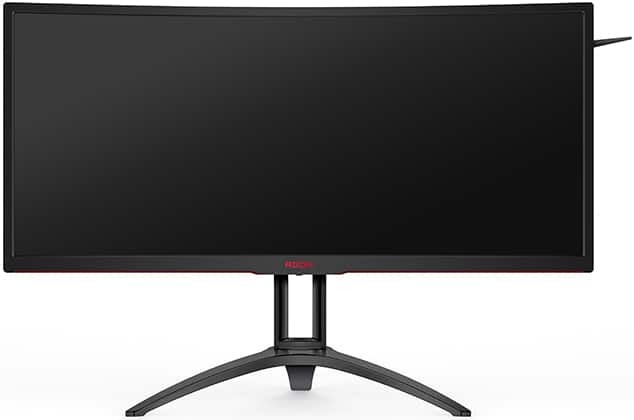 Moving on, the monitor supports AMD FreeSync and offers a mostly stable (some minor flickering is visible when the FPS rate drops below the dynamic range) G-SYNC performance with a 48-75Hz range over both DisplayPort and HDMI (HDMI only for AMD FreeSync). It also has the 1ms MPRT backlight strobing technology for smoother fast-paced motion. Other features including Black Boost (similar to Black Stabilizer) and Aim Point for customizable crosshairs. The Acer XR382CQK features a gorgeous and robust design with up to 130mm height adjustment, -5°/35° tilt, +/- 30° swivel, and 100 x 100mm VESA mount compatibility. Connectivity options are abundant and include a DisplayPort 1.2, a DisplayPort-Out, an HDMI 2.0 (with MHL 2.1), a quad-USB 3.0 hub (four downstream ports and one USB-C upstream port), a headphones jack, and two 7W DTS integrated speakers. If you don’t care for high refresh rates or would at least rather have a bigger screen for a more immersive gameplay experience, the Acer XR382CQK is for you. 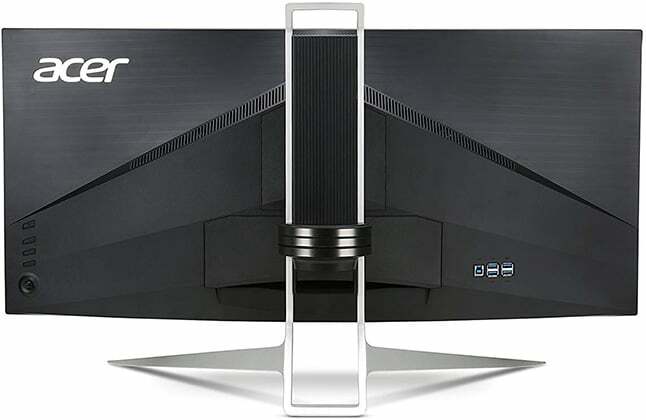 The Acer XR382CQK is still not big enough for you? Then you might like the Samsung C49HG90 49″ 32:9 super ultrawide monitor. With the aspect ratio of 32:9, you get even more horizontal screen space, however, the monitor has a resolution of 3840×1080 which may be too low for some users. Essentially, the monitor is like two 27″ 1920×1080 monitors (in terms of both pixel density and physical size) put next to each other, just without the gap and bezels in-between. Apart from that, the Samsung CHG90 delivers an amazing image quality thanks to its quantum-dot technology that enhances its contrast ratio and color gamut. Its VA panel has a static contrast ratio of 3,000:1 and a peak brightness of 600-nits for vivid details in the shadows and highlights of the picture. The color gamut is also extended to cover 125% of the sRGB color space. Lastly, the monitor boasts VESA’s DisplayHDR-600 certification and there’s a noticeable boost in image quality when watching HDR content. AMD FreeSync 2 is supported with a 48-144Hz dynamic refresh rate range over DisplayPort and 50-100Hz over HDMI. Additionally, the monitor has the 1ms MPRT backlight strobing technology for better motion clarity in fast-paced games. Note, however, that the Samsung CHG90 is the only monitor in this list that doesn’t have a flicker-free backlight. The flickering isn’t noticeable but those sensitive to it may experience headaches. Other features include Black Equalizer, gaming picture presets (FPS, RTS, RPG, AOS), and Arena Lighting RGB LEDs. Connectivity options include a DisplayPort 1.4, a mini-DisplayPort 1.4, two HDMI 2.0, a headphones jack, a microphone jack, and a dual-USB 3.0 hub. 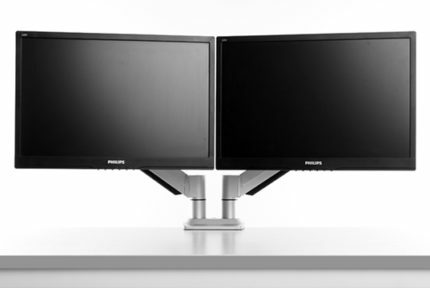 You can elevate the screen of the Samsung CHG90 up to 120mm, tilt it by -2°/12°, swivel by -/+ 30° or VESA mount it. Despite its low resolution for the size, the Samsung C49HG90 offers an immersive, responsive, and unique gaming experience; it’s one of those things you either love or hate. Got a high-end NVIDIA graphics card and want to take full advantage of it? 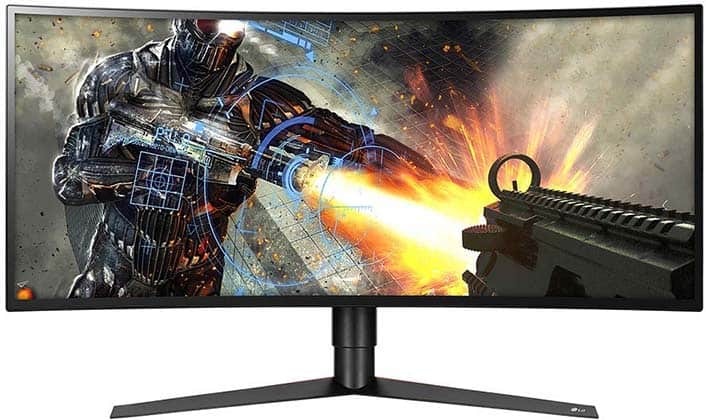 Getting a G-SYNC gaming monitor will allow your display and the GPU to work in perfect harmony thus eliminating screen tearing and stuttering for good. You also get support for variable overdrive and lower input lag. The LG 34UC89G is the G-SYNC model of the LG 34UC79G. These two ultrawide gaming monitors have almost identical specs, so we’ll only focus on the differences here while you can jump back to the LG 34UC79G review for more information. 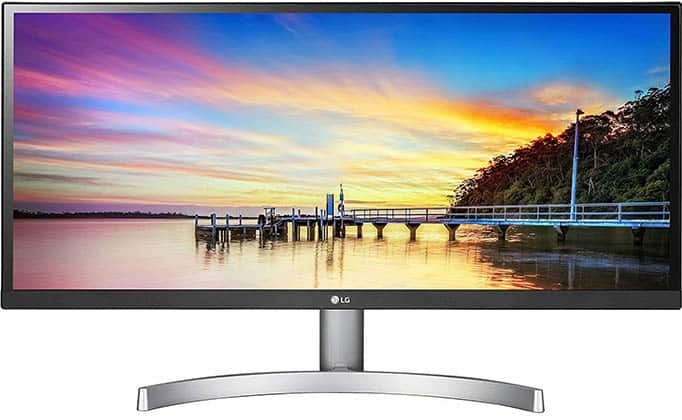 Both monitors offer the same image quality, although the LG 34UC89G does have a bit brighter image with a 300-nit peak brightness as opposed to 250-nits of the LG 34UC79G. 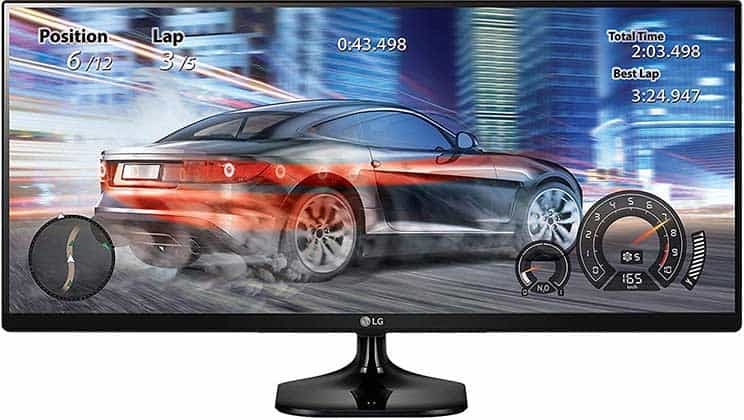 The LG 34UC89G is also overclockable to 166Hz and has a wider variable refresh rate range of 30-166Hz. However, the G-SYNC model has fewer connectivity options – two USB 3.0 ports, one DisplayPort, and one HDMI 1.4 port (2560×1080 at 60Hz max) whereas the LG 34UC79G has two extra HDMI 2.0 ports. Finally, the LG 34UC89G G-SYNC ultrawide gaming monitor has no motion blur reduction technology. It does have a variable overdrive and slightly lower input lag, but the LG 34UC79G doesn’t have any prominent ghosting nor delay either. So, is the slightly higher refresh rate and dynamic range worth the extra $100-$400 if you have an NVIDIA card? Well, if the difference is minimal (which is, in this case, $100) and you can afford it, the LG 34UC89G is worth it. Otherwise, go with the LG 34UC79G. 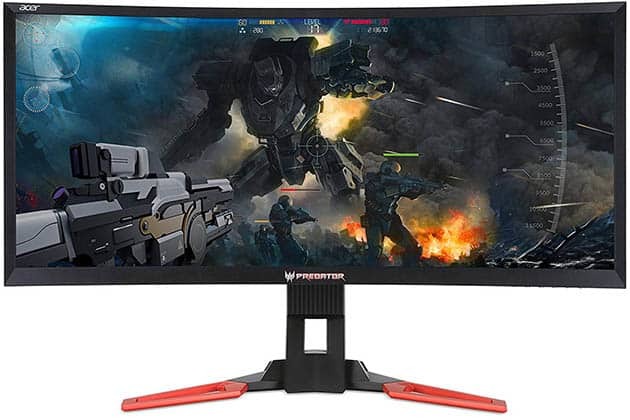 The Acer Predator Z35 is also a 144Hz 1080p ultrawide curved gaming monitor, but with a VA panel. In comparison to the LG 34UC89G, you get a higher contrast ratio (up to 3,000:1) for deeper blacks and more vivid details in the shadows of the image. Other panel-related specs include true 8-bit color depth, 100% sRGB gamut, and a 300-nit peak brightness. Unfortunately, the Acer Z35 has the same issue as all VA panel displays, that is the response time performance. There is noticeable smearing and motion blur in fast-paced games. 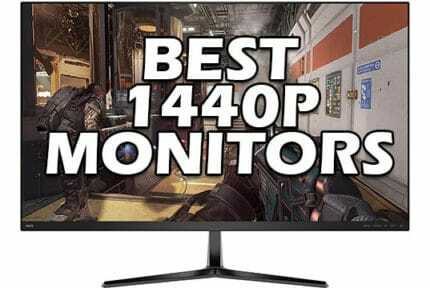 Even though the monitor can be overclocked to whopping 200Hz, the pixels cannot keep up with such high refresh rates which, in turn, results in more ghosting whenever you get over 120Hz/144Hz. Although the Acer Z35 features the NVIDIA ULMB motion blur reduction technology, even with it enabled, you still get more ghosting than you would on the LG 34UC89G. Besides NVIDIA G-SYNC and ULMB, you get Aim Point, Dark Boost, and Ambient Light RGB lighting features. Ergonomic options include up to 130mm height adjustment, -5°/25° tilt, and VESA mount compatibility. At the back of the monitor, there’s one DisplayPort 1.2, and HDMI (max 60Hz), a headphones jack, a quad-USB 3.0 hub, and 2x9W DTS built-in speakers. In short, if you mostly play fast-paced games, the LG 34UC89G is a better choice. If you’re more of an RPG or RTS type of gamer, the Acer Z35 will provide you with a more immersive picture quality as well as a flawless performance thanks to G-SYNC. 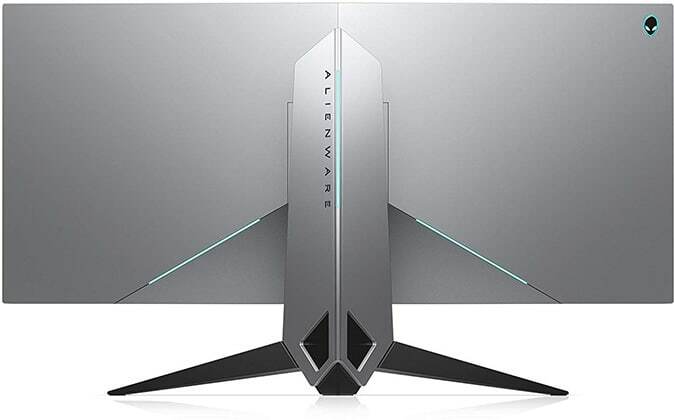 The Dell Alienware AW3418DW is the best 3440×1440 ultrawide gaming monitor with NVIDIA’s G-SYNC technology. Based on an IPS panel, the Dell AW3418DW delivers vibrant as well as accurate colors, but more importantly, it has no awful ghosting and smearing issues. It has a 100Hz native refresh rate that you can overclock in the OSD to 120Hz which is more than enough for a fluid and smooth gameplay. Other specifications include a 300-nit max luminance, a 1,000:1 contrast ratio, 178-degree viewing angles, and true 8-bit color depth. Furthermore, the monitor supports G-SYNC with a 30-120Hz dynamic range. Unfortunately, the Dell AW3418DW has no ULMB backlight strobing technology, but thankfully, it’s not all that necessary. You will also find other gaming features such as Dark Stabilizer, an FPS counter, an on-screen timer, as well as the FPS, RTS, and RPG picture presets. 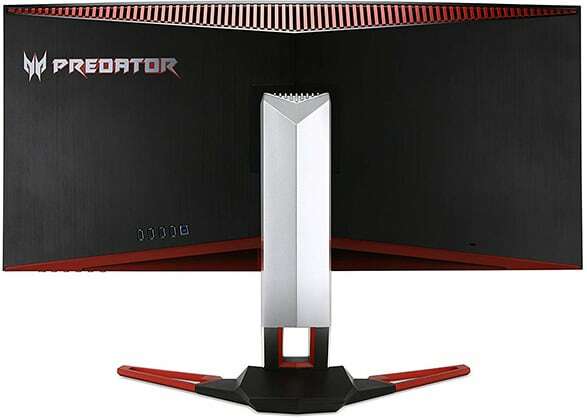 Lastly, the monitor boasts the AlienFX RGB lighting technology which consists of LEDs placed in four different zones: the stand, the bottom bezel, the power button, and at the back of the monitor. The futuristic design consists of a height adjustable stand, tiltable screen, and 100 x 100mm pattern for VESA mount. The screen curvature is 1900R. Connectivity options include a DisplayPort 1.2, an HDMI 1.4, a quad-USB 3.0 hub, and a headphones jack. The Dell Alienware AW3418DW is the best ultra-wide monitor for NVIDIA users. It delivers a flawless performance and a vibrant image quality; moreover, it’s got plenty of cool features and a high-quality design. 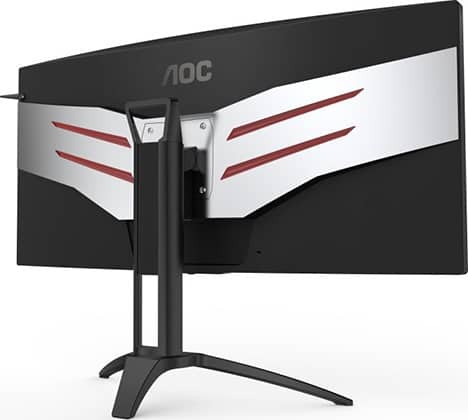 The AOC AGON AG352UCG6 is a similar ultrawide monitor to the Dell AW3418DW except that it has a VA panel. In comparison to the AW3418DW, you get the same 3440×1440 screen resolution and 120Hz overclockable refresh rate with G-SYNC support. With the AOC AG352UCG6, you also get a higher contrast ratio and a larger screen by an inch, but you also get a weaker response time performance. So, it’s the same dilemma as with the Acer Z35 and the LG 34UC89G. In the OSD menu of the AOC AG352UCG6, you will find plenty of gaming features including Shadow Control (similar to Black Stabilizer) and the FPS, RTS, and Racing picture presets. The monitor also has an RGB lighting technology; you can change the color (red, green, or blue) of the LED strips located at the back and beneath the bottom bezel of the monitor. The AOC AG352UCG6 has a versatile design with up to 110mm height adjustment, -5°/28° tilt, -/+ 30° swivel, and it’s VESA mount compatible. Concerning the connectivity options, there’s a DisplayPort 1.2, an HDMI 1.4, a microphone jack, a headphones jack, a dual-USB 3.0 hub, and two 2W integrated speakers. If you want deeper blacks, go with the AOC’s model but keep in mind that you will have to cope with dark pixels smearing in fast-paced games as there’s no backlight strobing technology. For better performance in fast-paced video games, the Dell AW3418DW is better, and you still get an excellent image quality, just not as vivid details in the shadows. 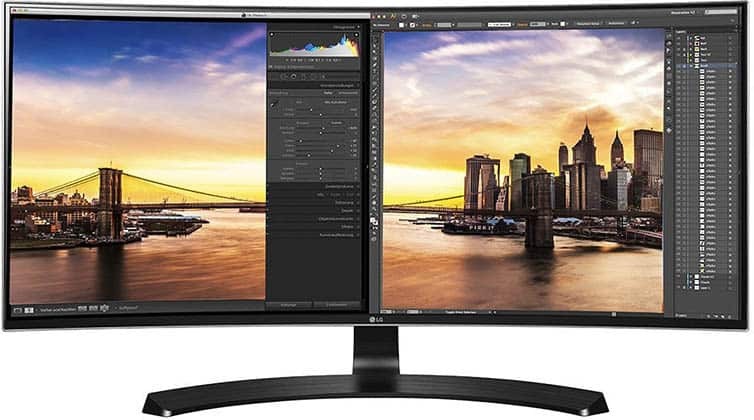 While most of the ultrawide monitors mentioned so far would work just fine for entry-level video and photo editing, the following monitors offer the best color accuracy and consistency. For non-ultrawide professional monitors, visit our best photo editing and video editing monitor buyer’s guide. The Dell U3419W is a lot similar to the LG 34UC80. 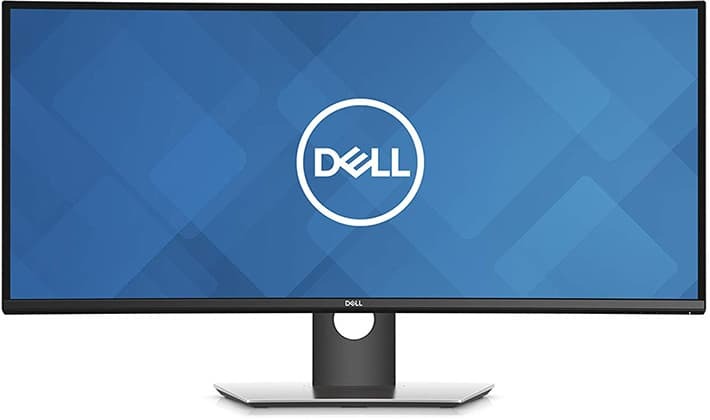 You get the same 34″ 3440×1440 IPS panel, but instead of AMD FreeSync, the Dell U3419W is factory-calibrated at Delta E < 3 and offers additional exclusive features. While the Dell U3419W is based on the same IPS curved (1900R) panel used in the LG 34UC80, Dell tweaked their model a bit better with Delta E less than 3 factory calibration for professional-grade color accuracy straight out of the box. Other panel-related specs are identical including a 1,000:1 contrast ratio, a 300-nit peak brightness, 99% sRGB color gamut, and 10-bit color support via dithering. 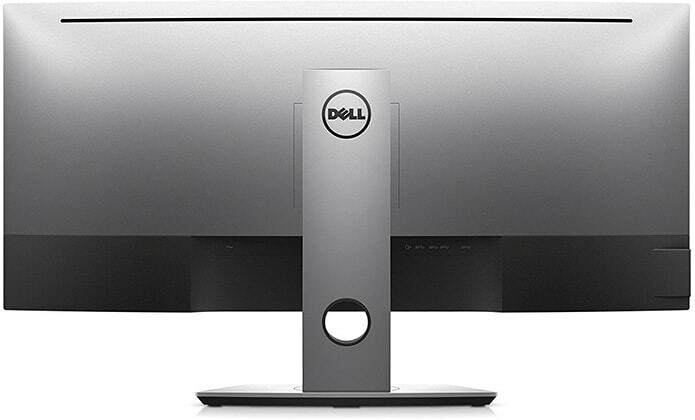 In addition, the Dell U3419W features a built-in KVM switch (Keyboard-Video-Mouse) which allows you to connect two PCs to the screen, and control both PCs with just one set of keyboard and mouse. So, the Picture by Picture and Picture in Picture modes are supported as well. There is a plethora of connectivity options available including a DisplayPort 1.2, two HDMI 2.0, a USB-C port with up to 90W power delivery, four downstream USB 3.0 ports and two upstream (for KVM), a headphones jack, and an audio line-in for the 2x9W built-in speakers. The design is sleek as well as versatile with up to 115mm height adjustment, -5°/21° tilt, +/- 30° swivel, and VESA mount compatibility. The Dell U3419W is the best ultrawide monitor for work if you’re looking for a 34″ 3440×1440 display. The ViewSonic VP3881 is based on the same panel as the Acer XR382CQK, but just like it’s the case with the previous display, ViewSonic’s model ditched the gaming features for superior color accuracy. And it’s more affordable as well! The ViewSonic VP3881 is factory-calibrated at Delta E less than 2 and covers 100% of the sRGB and Rec. 709 color spaces. So, you get even better color accuracy than with the Dell U3419W. Additionally, the monitor supports 14-bit 3D LUT (Look-up Table) for a wider color palette of 4.39 trillion colors. Other panel-related specs include the 3840×1600 UWQHD+ screen resolution, dithered 10-bit color depth, a 300-nit peak luminance, and a 1,000:1 static contrast ratio. 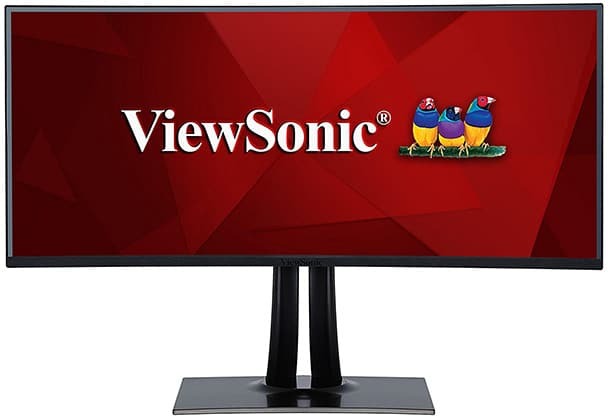 The ViewSonic VP3881 also supports HDR, but it’s software-enabled only. Moving on, the monitor offers additional useful features such as Dual Color which allows you to split the screen in two and have different color spaces for each half. 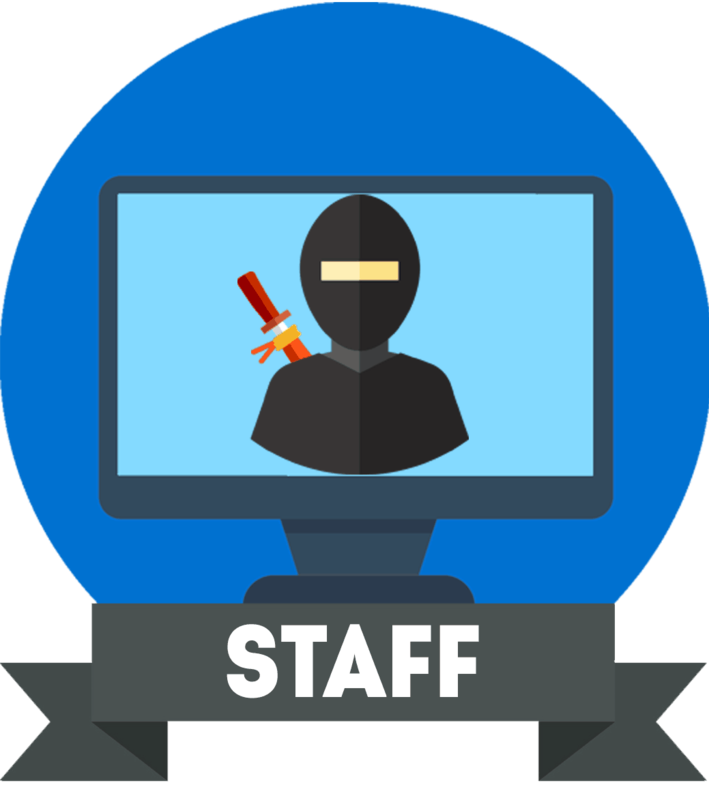 There are also customizable and predefined picture profiles for various different purposes such as CAD/CAM, Animation, Video Edit, Photographer, etc. 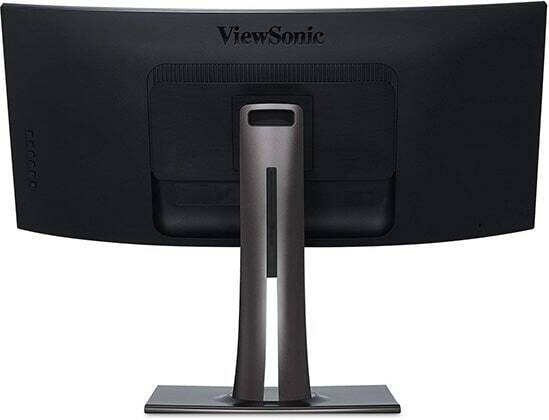 The ViewSonic VP3881 ultrawide monitor has an ergonomic design with up to 130mm height adjustment, +/- 120° swivel, -1°/21° tilt, and 100 x 100mm VESA mount compatibility. Connectivity options include a DisplayPort 1.4, two HDMI 2.0, a USB type C port, three downstream and one upstream USB 3.0 ports, a headphones jack, and two 5W integrated speakers. On balance, the ViewSonic VP3881 is the best ultrawide monitor for professional use under $1,000. The LG 34WK95U is the first and only (for now) ultrawide display to feature a screen resolution of 5120×2160 pixels. Some refer to it as 4K ultrawide or even 5K ultrawide, but LG simply calls it ‘5K2K’. 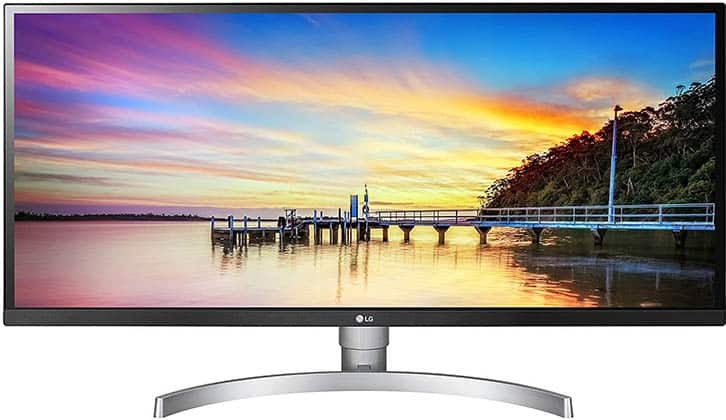 Besides offering a high resolution that results in an incredibly rich pixel density of 163 pixels per inch (same as 2560×1440 on 27″ screens), the LG 34WK95U has the latest Nano IPS panel technology with 98% DCI-P3 color gamut. So, you get flawless details, plenty of screen space, and stunning color quality. The monitor also has VESA’s DisplayHDR-600 certification, but its static contrast ratio of only 1,200:1 will cause most of the extra HDR details to be lost. Other-panel related specs include a 450-nit peak brightness (600-nit for HDR content), 178-degree viewing angles, a 60Hz refresh rate, a 5ms response time speed, and naturally, 10-bit color support (8-bit + 2-bit FRC). In order to reach 5120×2160 at 60Hz, you will need to use either DisplayPort 1.4 or Thunderbolt 3, though your device needs to support Intel’s Titan Ridge version of Thunderbolt 3. HDMI 2.0 limits the resolution to 3440×1440. Connectivity options on the monitor are as follows: a DisplayPort 1.4, two HDMI 2.0, a USB type C port (Thunderbolt 3), a headphones jack, a dual-USB 3.0 hub, and two 5W built-in speakers. You can elevate the screen of the monitor up to 110mm, tilt it by -5°/15°, and VESA mount it using the 100 x 100mm pattern. Want the best image quality possible on an ultrawide display? The LG 34WK95U won’t disappoint you, just make sure your device is capable and compatible. Did you manage to pick the best ultrawide monitor for you? Let us know if you need any further help in the comments below! All in all, the LG 34UC79G offers the best value for money if you’re into fast-paced video games while the LG 34UC80 is great if you don’t care for high refresh rates but would rather have a higher resolution – and the MSI MAG341CQ offers a good balance between the two. For the best gaming experience, we recommend either the LG 34GK950F or the Dell Alienware AW3418DW according to your budget and preferences. If you’ve got a limited budget, the LG 29WK600 will provide you with a spectacular image quality for the price; the 34″ 34WK650 also isn’t bad, but only if you’ll mostly play video games on it. As far as professional use is concerned, the ViewSonic VP3881 will undoubtedly increase your productivity and creativity.